Washington, D.C., April 11 — As the economy expands, for the first time in decades people with disabilities are gaining jobs, success and independence. According to new data, Wisconsin continues to have one of the nation’s highest employment rates for people with disabilities, outperforming bigger states like Texas and California. People with disabilities, who have previously been left out of periods of economic growth, are succeeding thanks to workforce system better aligned to enable them to succeed, just like anyone else. 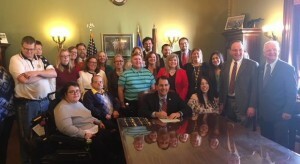 According to RespectAbility, a national organization that fights stigma and advances opportunity for people with disabilities, Wisconsin now ranks 14th on jobs for people with disabilities. In total, there are 344,120 working-age people with disabilities living in that state and 143,726 of them have jobs. Wisconsin has a 41.8 percent employment rate for its people with disabilities. Beyond PROMSE, Project SEARCH is the other major component of Wisconsin’s deep commitment to successful school-to-work transitions for youth with disabilities. Project SEARCH is a program that empowers young people with intellectual and developmental disabilities to successfully transition from the classroom and into the world of work. Without this type of support, young people with disabilities face incredible challenges entering the workforce and earning an income. In 2013, Wisconsin was home to only three such programs, serving only around 36 youth with intellectual and developmental disabilities each school year. In 2015, Project SEARCH in Wisconsin added 14 new sites, serving approximately 140 youth each year. Because of the Blueprint for Prosperity Initiative, launched by Gov. Scott Walker in 2014, Wisconsin will soon host a total of 27 sites, serving more than 300 youth with disabilities annually. This legislative victory for advocates reflects a long running effort by Wisconsinites with disabilities to expand and improve employment opportunities. Early in 2017 Wisconsin held its fourth annual Employment First conference. They brought together businesses, officials, and people with disabilities to talk about employment changes made and changes to come. One of the changes that came after the conference was the giving of 14 grants to dedicated Employment First community partners. The recipients will use the grants to fund activities and initiatives designed to expand employment opportunities for people with disabilities. Governors have a critical role to play by embracing the efforts of self-advocates and advancing opportunities through their leadership at the state level. Former Governor Jack Markell of Delaware is a model of what a state chief executive can accomplish by making jobs for people with disabilities a key priority. As Governor, Markell chaired national initiatives with both the National Governors Association (NGA) and later the Council on State Governments (CSG). Both the Better Bottom Line Initiative of the NGA and CSG’s Work Matters Report focused on fighting stigmas, supporting strong public policies and using best practices at the state level. RespectAbility, like most governors and employers, emphasizes the critical link between education attainment and workforce development. “Employment rates only tell part of the story,” said Philip Kahn-Pauli, Policy and Practices Director at RespectAbility, “Educational attainment is critical to the success of youth with disabilities because the jobs of the future require technical education and skill training.” Wisconsin had an overall high school graduation rate of 88.2 percent in 2016, but only 68.5 percent of the students with disabilities graduated. That puts Wisconsin students with disabilities behind other minority students who graduate high school at higher rates.